Back in the day, the music industry was run by the labels and they promoted and sold whatever talent they had under contract. The process was easy to control, the distribution channels were firmly established and the talent took what they were given. That day is over. Today social media is everything. 'Social media' is basically the world's conversations being delivered by a variety of devices and these conversations are about everything, including music. People download an artist's work and then tweet all their friends about it, acting inadvertently as critics, promotions and sales. What the labels would spend a fortune trying to accomplish is now at hand for free. But that doesn't mean it's easy. In order for an artist to gain an audience and to get mass recognition they must make the plunge into social media. In order to compete with all the other savvy players they must have control of their presence in all the domains of the Internet. They need to be at the top of all the Search Engines with all the right key words and phrases, they need to be on all the social networks, all the news sites, all the PR pages. They need their brands to soar through the social media universe. What's more, they need to do it as much as possible about news, events and happenings! And there's no way they can do it alone. That's where RockStar Nation comes in. It's a social network platform like no other. 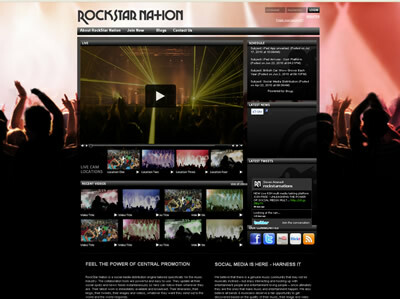 RockStar Nation is a social media distribution engine tailored specifically for the music industry. The collaboration tools are powerful and easy to use. They update all their social spots and news feeds instantaneously so fans can follow them wherever they are. Their latest work is immediately available and broadcast. Their itineraries, their blogs, their tweets, their images and videos, whatever they want they send out to the world and the world responds. Using OBB's tools from their digital broadcast platform, we've automated our social media optimization efforts and focused the point of origin of all news and branding messages to enhance visibility in search engines.